This section provides instructions for adding an individual TLK 100 device. You can add the TLK 100 devices one at a time or you can add them to WAVE using a spreadsheet. The spreadsheet method is advised if you have many TLK 100 devices to add. For instructions on adding multiple devices via spreadsheet see Importing TLK 100s from a Spreadsheet. Login to WAVE using your Customer account credentials. The TLK 100s page opens displaying all registered TLK 100 devices. Initially, this page will be empty. The TLK 100 Registration Wizard opens. Click the ADD button. If the device was identified then the information for the device appears on the screen below the entry fields. If the device was not identified then an error message appears and you must re-enter the numbers again or contact support. In TalkGroups, select the Talkgroups available for use by this TLK 100 unit. These are the Talkgroups you have already created. You may also add or remove TLK 100 units to Talkgroups later. In Contacts, select the users that this TLK 100 can Private Call. 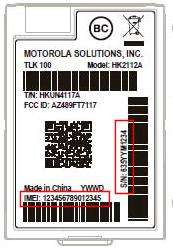 You may also add or remove Private Call contacts from this TLK 100 unit later. Review the summary information page for the correct information and then click the SUBMIT button. If you do not have enough WAVE wireless licenses to activate all your devices you will be prompted to purchase them. You can also purchase WAVE wireless licenses directly from your Account page.